After waiting roughly 50 weeks for basketball that was both close and meaningful...we did not get that. We got destruction, a 113-91 Warriors win led by Kevin Durant’s 38-8-8. What we did get was the start of a pretty great athlete-celebrity beef, and neither is going to fold as easily as the Cavaliers’ defense. Rihanna is a LeBron James superfan, and woe be unto any Warriors fan sitting behind her who wants to stop her from paying tribute. 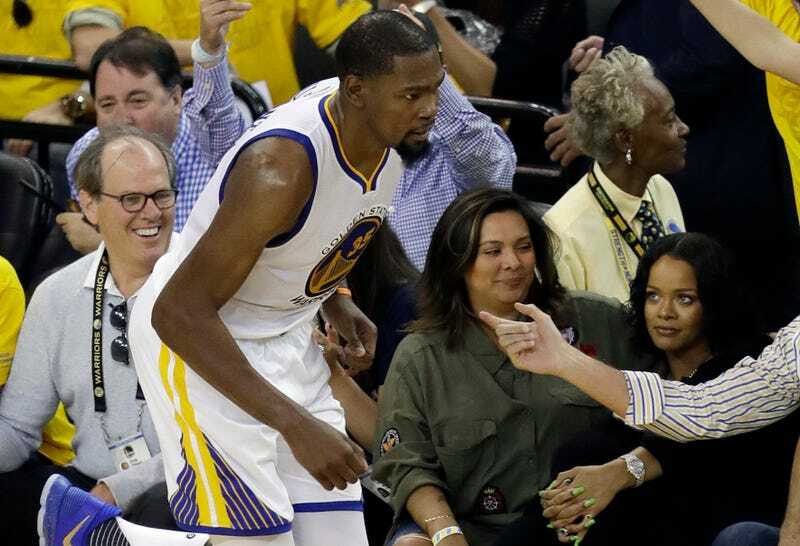 Durant hit both foul shots, and glanced Rihanna’s way. Just to say “I see you,” or to register her location for later. Because with the game already put away late in the fourth, Durant hit a three, and before the ball had even hit the floor he had turned to give Rihanna a little staredown. In his postgame press conference, Durant denied any knowledge of said staredown. He said he didn’t remember it. (Mmm-hm.) Steph Curry, sitting to his right, urged him, “Don’t get into that trap,” and Durant promised he wouldn’t. There’s a history here, but it’s pretty one-sided and it’s thirsty as hell. Look, KD, you’re gonna have to wait till Jeff Van Gundy shoots his shot. Game 2 is Sunday night, and if the score is anything like this one, we’ll have to take our drama where we can get it.